Where previously the threat of renewed trade war between the US, also known as the "+1" in this weekend's meeting of G6+1 nations, and EU, Canada, Mexico, and of course, China, would have been sufficient to pummel futures and stocks, today stocks are approaching life with a "glass half full" approach, and global markets and US equity futures are green across the board. There were two key factors for today's bout of optimism: i) the return of the US-North Korea summit on June 12 and ii) Friday's strong (pre-tweeted) US payrolls report, which surprised to the upside and has put protectionist fears to the side, spurring Euro stocks and S&P futures to a gain after peers in Asia jumped. Treasuries slipped alongside the dollar, while the pound and euro rose. Helping sentiment was the continued sharp drop in Italian yields, with both the Italian 2Y spread to German bunds..
... as well as the 10Y sliding to levels far below last week's crisis highs. Europe's Stoxx 600 Index jumped (0.5%) as every industry group traded in the green, with utility companies leading the way as markets continue to digest Friday's NFP report and the rescheduling of the NK-US summit on June 12th, thus outweighing the lingering trade concerns which saw the US and China fail to reach an agreement over the weekend, albeit both parties stated that progress had been made. The IBEX (+1.2%) is the outperformer amid positivity on the domestic political front. The FTSE MIB is fluctuating between positive and negative as political uncertainty in the region is leading to volatile trade. Utilities are currently outperforming with Iberdrola leading the sector (+3.0%) after an upgrade at Goldman Sachs. Earlier in the session, Asia equity markets started the week higher across the board with the MSCI Asia Pacific Index surging 1.3% even as China warned it will withdraw from commitments it made on trade if President Donald Trump carries out a separate threat to impose tariffs on the Asian country; instead traders found support in the abovementioned double-dose of optimism from strong jobs data and after US President Trump confirmed the summit with North Korea will go ahead as initially planned in Singapore on June 12th. ASX 200 (+0.5%) and Nikkei 225 (+1.4%) were both positive from the get-go with CYBG shares leading the advances in Australia after the Co. sweetened its merger bid for Virgin Money, while the Japanese benchmark was among the outperformers as it coat-tails on a weaker currency. Hang Seng (+1.3%) and Shanghai Comp. (+0.2%) also conformed to the broad upbeat sentiment following a net liquidity injection by the PBoC and amid reports that China widened the collateral for its Medium-term Lending Facility which will include qualified credit bonds. In the US, S&P 500 futures are up roughly 10 points, and point to an extension of Friday’s advance. The 10-year Treasury yields traded above 2.90% even as the USD slid. In macro and FX markets, safe-havens were under strain in which JPY took the brunt of the heightened risk appetite which saw USD/JPY and JPY-crosses extend Friday gains, with the yen and the dollar weakening against most major peers as demand for haven assets faded now that Italy and Spain are fixed again, if only for the next few hours, and Asian stocks rallied following Friday’s better-than-expected U.S. payrolls data. After rising 7 consecutive weeks, the Bloomberg Dollar Spot Index fell 0.4% to start the week. The euro reversed its decline from Friday and retested the $1.17 handle boosted by unwinds versus the yen and the Swiss franc, as demand for haven assets wilted; the Aussie jumped on purchases against the yen and was later boosted further by stronger-than-expected local retail sales data, while Scandinavian currencies benefited from the improved risk sentiment. The Turkish lira advanced after a surge in inflation (CPI soared 12.15% from 10.85% last) spurred speculation the central bank will raise rates this week The Aussie jumped on purchases against the yen and was later further boosted by stronger than expected local retail sales data. AUD/JPY rallied 0.6% to 83.435 while EUR/JPY rose 0.3% to surpass Friday’s high of 128.14. 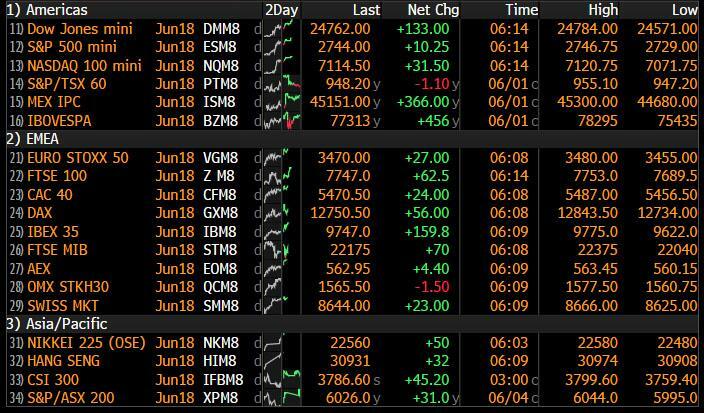 Still, as Bloomberg notes, with concerns about the euro area somewhat assuaged and emerging markets settling down after the recent sell-off, attention may yet turn back to trade. The G-7 meets in Quebec later this week, with the European Union and Canada threatening retaliatory measures unless Trump reverses course on new steel and aluminum levies. Trump will be present at this meeting. For those who missed the latest trade developments, over the weekend US Commerce Secretary Ross travelled to Beijing for the 3rd round of trade talks with China which ended without a deal. However, there were comments by Ross that meetings were friendly and frank, while China commented that they have made concrete progress but warned any action by US to impose punitive tariffs would derail the negotiations. White House Economic Advisor Kudlow stated that Canadian PM Trudeau’s response to the US tariffs on steel and aluminium was an overreaction, while he added the tariffs may last a while or not which is subject to negotiations and that he views the issue as more of a family quarrel. Meanwhile, Canada launched WTO and NAFTA cases on US metal tariffs. In geopolitics, weekend reports suggested North Korea could have faked detonation of its nuclear test site last month, as it cited dust from explosions and journalists being 500 metres from the explosion which indicates small blasts. US officials reported that North Korea’s top three military officials have been replaced. Syrian President Assad plans to visit North Korea to meet with Kim Jong Un. Elsewhere, WTI crude edged lower, sliding below the 100DMA for the first time since September, amid speculation OPEC may phase out supply cuts at a time when American shale continues to surge. WTI (-0.7%) and Brent (-1.4%) prices have thus far failed to significantly rebound from the losses seen at the back end of last week after shedding more than 9.9% from the multi-year high levels, while the unofficial OPEC+ meeting during the weekend also continued to signal an unwillingness to ease restrictions. Prices were also subdued by the weekly Baker Hughes rig count showing an increase of 2 oil rig. Elsewhere, gold (+0.1%) is uneventful while shanghai copper hits highs of more than six weeks, underpinned by a marginally softer dollar and labour negotiations at the world’s largest copper mine. Dalian iron ore however fell almost 2% as it moved in tandem with steel prices amid the iron ore stockpiles at China’s port surging to record levels. Economic data include orders for durable goods. Palo Alto Networks, Dell Technologies are among companies reporting earnings. ECB Governing Council member Ewald Nowotny, Bank of England policy maker Silvana Tenreyro speak. As we first mused over the weekend, and UBS did this morning, Trump has so far not tweeted an advance preview of this morning's durable goods number. UBS: "US durable goods and capital spending data is due today. US President Trump has not tweeted anything about these numbers – that might be a signal that the data is bad, or it might be that the president was distracted and tweeting about other things"
European equities are positive (Stoxx 600 +0.6%) as markets continue to digest Friday's NFP report and the rescheduling of the NK-US summit on June 12th, thus outweighing the lingering trade concerns which saw the US and China fail to reach an agreement over the weekend, albeit both parties stated that progress had been made. The IBEX (+1.8%) is the outperformer amid positivity on the domestic political front. The FTSE MIB is fluctuating between positive and negative as political uncertainty in the region is leading to volatile trade. Utilities are currently outperforming with Iberdrola leading the sector (+3.3%) after an upgrade at Goldman Sachs. M&A news is in focus, primarily with Accor’s interest in an Air France KLM (+7.0%) stake. Additionally Bayer announced a EUR 6bln cash call for the June 7thMonsanto acquisition. Finally, there were rumblings that Unicredit (+0.5%) and SocGen (+2.0%) were considering a merger; this was denied by SocGen, however. In FX, the dollar index is pivoting 94.000 having failed to derive any lasting benefit from Friday’s strong NFP release, as the key wage component continues to lag. AUD was the clear G10 outperformer on several bullish/supportive factors, including overnight data in the form of retail sales, company profits and Q1 business inventories that all exceeded expectations. Coupled with broadly risk-on sentiment on the back of Friday’s upbeat US jobs report and geopolitical news (June 12 summit between US and NK back on track), which offset another US-China summit ending without anything tangible in terms of import tariff trade-offs, Aud/Usd has finally established a firmer foothold above 0.7600 and breached chart resistance through 0.7605-13 incorporating the 50 DMA (0.7610). Aud buyers are now testing 0.7643- 60 that encompasses a key Fib and a chart channel, but the bout of strength may not be greeted with enthusiasm by the RBA on Tuesday given recent policy statements highlighting the adverse impact of a strong currency on the growth, wage and inflation outlook. Note, the latest GDP update follows hot on the heels of the RBA policy meeting on Wednesday. JPY Usd/Jpy nearer the base of a 109.45-75 band, with offers seen above 109.90 according to market observers and big option expiries also keeping the headline pair in check (1.7 bn at the 110.00 strike vs 1.4 bn between 108.90-109.05). TRY Off worst levels prompted by Moody’s ratings downgrade alert for Turkey as a pick up in inflations underpins CBRT rate hike prospects for this Thursday. Usd/Try near the base of 4.6780-5940 trading parameters. In commodities, WTI (flat%) and Brent (-0.2%) prices have thus far failed to significantly rebound from the losses seen at the back end of last week after shedding more than 9.9% from the multi-year high levels, while the unofficial OPEC+ meeting during the weekend also continued to signal an unwillingness to ease restrictions. Prices were also subdued by the weekly Baker Hughes rig count showing an increase of 2 oil rig. Elsewhere, gold (flat) is uneventful while shanghai copper hits highs of more than six weeks, underpinned by a marginally softer dollar and labour negotiations at the world’s largest copper mine. Dalian iron ore however fell almost 2% as it moved in tandem with steel prices amid the iron ore stockpiles at China’s port surging to record levels. It's a fairly quiet start to the week with final April factory, durable and capital goods orders in the US. The ECB's Nowotny is due to speak in the afternoon at a conference in Vienna. EU Trade Commissioner Malmstrom is also due to participate in the UN Conference on Trade and Development in Geneva, while votes of confidence on the new Italian government is expected to happen early this week. Elsewhere, the ECB’s Nowotny and BOE’s Tenreyro are due to speak. Wow. What a week we saw last week. My 33-month old Maisie has just learnt the word boring and now says it all the time. So at the moment I’d guess she’d be the only person on the planet to have found last week’s wild ride in BTPs dull. To recap Italian 2 and 10 year bonds rose 54.8bp (to 1.01%) and 21.3bps (to 2.64%) over the week, but the 2y traded in a range of 0.25% to 2.76% from intra-day lows to highs last week. To cut a long story short the market was at its lows when it thought that fresh elections were likely. The concern being that the populists would use the President’s refusal to sign off on proposed finance minister Savona as a lightening rod for even more support and perhaps a firming of extreme views on Euro membership. However we rallied back as all sides got back round the negotiating table and an alternate FM nominee found. As such it feels like we go back to this being more of a slow burning clash between the new government and the EU over immigration, Italy’s budget and the general direction of the Eurozone. The budget is set to be delivered on September 20th so whether the market can sustain perpetual interest in this story between now and then probably depends on how strong the rhetoric of the new administration is. Staying with Italy, the new Interior Minister and League Party Leader Salvini travelled to Sicily over the weekend and told his supporters that “Italy and Sicily cannot be Europe’s refugee camp” and illegal immigrants to “pack their bags”. Meanwhile, the 5Star Leader Di Maio has told reporters from Ansa that one of his first measures will be a guaranteed income for poorer Italians, while he also indicated that the prior administrations’ 2015 labour reforms - “the Jobs Act must be reviewed” without elaborating more. Elsewhere, the latest Ipsos poll suggests more balanced support between the two populist parties, with support for the League Party growing to 28.5% vs. 17.4% of votes received in the March 4 election, while support for 5Star fell to 30.1% from 32.7%. Moving along, one of the most interesting side stories last week was the flight to quality into bunds in a week where German HICP inflation printed at 2.2% yoy vs 1.8% expectations. Clearly if Italy implodes over the next few months the move is fair enough. However if it doesn’t, this could go down as a once in a generation opportunity to short bunds. If you think this is hyperbole, a reminder that we published a quick note (see link ) last week showing that the gap between German yields and inflation was getting back to the highest on record with data stretching back to the 1950s. So maybe we should have said ‘once in 3 generations’. Turning now to the US / China trade talks over the weekend, which didn’t seem to go that smoothly. After the talks, China’s Xinhua agency warned “if the US introduces trade sanctions including raising tariffs, all the economic and trade achievements negotiated by the two parties will be void”. On the other side, Commerce Secretary Ross said “our meetings so far have been friendly and frank, and covered some useful topics about specific export items” without elaborating more. DB’s Zhiwei Zhang and team believes if the US decides to impose tariff on the US$50bn Chinese exports on June 15, they think China will retaliate with tariffs on US exports of similar value. Overall, this would be a clear escalation of the trade war with significant impact on the Chinese and global economy. China would likely have to loosen fiscal policy and boost investment growth, halt the deleveraging process, and potentially loosen control over the property sector as well. In their view, such policy measures would help to keep the economy stable in the short term, but worsen macro risks in the longer term. Following on with trade, the G7 meetings over the weekend also didn’t seem to reach tangible agreements. The G7 Finance Ministers did request that US Treasury Secretary Mnuchin communicate their “unanimous concern and disappointment” regarding the US imposing steels tariffs on its allies, with the Canadian Finance Minister Morneau indicating “decisive action” is needed at a Leaders’ summit this week in Quebec. Meanwhile Germany’s Economy Minister Altmaier said the EU will present retaliatory tariffs on the US within the next two weeks, while French Finance Minister Le Maire left the door open for more talks as he noted “we want to avoid a trade war, but everything is ready” and “we still have a few days to avoid an escalation”. So lots bubbling along. This morning in Asia, markets have shrugged off trade and G7 tensions and are trading higher following the positive US lead from Friday, with the Nikkei (+1.29%), Hang Seng (+1.24%), Kospi (+0.28%), and Shanghai Comp. (+0.25%) all up as we type. Meanwhile, the yield on UST 10y is up c1bp while futures on the S&P are marginally up. Now recapping performance from Friday. The S&P rose +1.08% after the above market US employment report lifted optimism about the US economy, while the Stoxx 600 also firmed +1.01% following reduced political uncertainty in Italy and Spain. The Nasdaq (+1.51%) and Italian banks outperformed while the VIX fell 12.8% to close modestly higher for the week (13.46). In government bonds, core 10y bond yields climbed 4-5bp (UST & Bunds +4.4bp; Gilts +4.9bp) while Italian BTPs and Spanish bonds both rallied with yields down 6-11bp. Meanwhile, the US dollar index firmed for the first time in three days (+0.19%) while the Euro weakened -0.29%. Elsewhere, WTI oil extended losses to be $65.81/bbl (-1.8%; -3.1% for the week). Over in Spain on Saturday, the Socialist Leader Mr Sanchez was sworn in as the new PM after he won a no confidence vote against the incumbent PM Rajoy. DB’s Marc de-Muizon believes a Sanchez-led government would be a pro-EU government with new elections unlikely to occur until later in 2019. Overall, Marc believes Sanchez will likely try to facilitate dialogue over the Catalan situation. However, he would have little ability to either push for reforms or cancel previous reforms. Meanwhile, on a fiscal basis, Sanchez will likely remain very close to what was defined by the latest budget passed by Rajoy (Link) Moving onto geopolitics and North Korea. Back on Friday, President Trump has confirmed his summit with NK’s Kim Jong Un is now back on, although the Secretary of Defense Mr Mattis has warned that “we can anticipate at best a bumpy road to the negotiations” while reaffirming that NK “will receive relief only when it demonstrates verifiable and irreversible steps to denuclearisation”.Meanwhile, Yonhap has reported that Kim has replaced three of his top military officials, which was later confirmed by unnamed US officials to Reuters. US officials believe there was some dissent in the military regarding Kim’s approach to the US. Back to Italy, this morning Michal in my team published the report “Assessing Contagion from Italy to Corporate Credit” in which he analysed the intensity of contagion across various parts of the credit market, from vanilla bonds to AT1s to derivatives. He notes that while contagion to most of credit has been limited so far, the system remains vulnerable to any rise in perceived Eurozone break-up risks which should keep vol. and spreads elevated until there is more clarity about Italy’s politics and stance towards Europe. Before we take a look at today’s calendar, we wrap up with other data releases from Friday. In the US, the macro data releases were broadly stronger than expectations. The May change in nonfarm payrolls was above market at 223k (vs. 190k expected) while the six-month average gain was also solid at 202k. In the details, employment in the service sector rose the most since February (+171k), while solid gains were also recorded in the manufacturing and construction sectors. The average hourly earnings growth beat at 2.7% yoy (vs. 2.6% expected), to just below the January high of 2.8%. Meanwhile, the May unemployment rate edged down 0.1ppt to 3.8% (vs. 3.9% expected), which now joins April 2000 as the lowest unemployment rate since 1969. Elsewhere, the May ISM manufacturing was also above expectations at 58.7 (vs. 58.2 expected) with the prices paid index now at the highest since April 2011 (79.5 vs. 78 expected). The final reading of May’s manufacturing PMI was also revised 0.2pt lower to 56.4. Following the above, the Atlanta Fed’s estimate of Q2 GDP growth has edged up a 0.1ppt to 4.8% saar, while the NY Fed’s estimate was revised up 0.3ppt this week to 3.3% saar. In Europe, the final readings for the May manufacturing PMIs were broadly in line. The Euro zone’s PMI was confirmed at 55.5 while Germany was revised up 0.1pt to 56.9 and France down to 54.4 (vs. 55.1 expected). Meanwhile, for flash PMIs, Italy was slightly below expectations to an 18-month low of 52.7 (vs. 53 expected) while the UK’s print was above market and rose for the first time since last November (54.4 vs. 53.5 expected). The final reading for Italy’s 1Q GDP was confirmed at 1.4% yoy. As for this week, it’s a classic quiet post-payroll week with the data highlights being the final European May PMIs (services and composite) also due on Tuesday including a first look at the non-core and UK. What to look out for today: It's a fairly quiet start to the week with the most significant data releases being the May construction PMI in the UK, along with the June Sentix investor confidence and April PPI report for the Euro area, and final April factory, durable and capital goods orders in the US. Away from that the ECB's Nowotny is due to speak in the afternoon at a conference in Vienna. EU Trade Commissioner Malmstrom is also due to participate in the UN Conference on Trade and Development in Geneva, while votes of confidence on the new Italian government is expected to happen early this week. Elsewhere, the ECB’s Nowotny and BOE’s Tenreyro are due to speak.